William Eric Thorp was born in London in 1901. He studied at the City of London School under the drawing master Herbert Dicksee and at the Royal Academy Schools. He was the youngest member ever to be elected to the ‘Artist’s Society’ at the age of seventeen, joining the ‘Langham Art Club’ in 1917 and also a member of the ‘London Sketch Clubs’ and ‘Chelsea Arts Club’. He was principally a Marine artist and was a founder member of the ‘Wapping Group’ in 1947 becoming President for six years from 1966-1972. W Eric Thorp exhibited at the ‘Royal Academy’, the ‘Pastel Society’ becoming a member in 1952 and the ‘Royal Society of Marine Artists’ in 1958. He showed at the ‘RA’, ‘Paris Salon’ and elsewhere and his work is in permanent collections at the Guildhall Art Gallery, National Maritime Museum in Greenwich and the Imperial Institute. 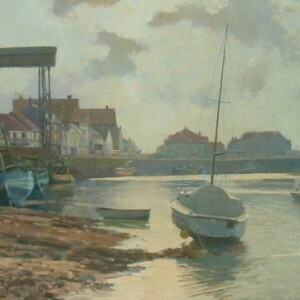 Painting in oils and other media concentrating on Marine subjects he received commissions by shipping companies and his work hangs in many private collections. Leading publishers also purchased W Eric Thorp’s work for reproducing limited prints. W Eric Thorp’s work is greatly admired and avidly collected, conveying such clever use of light on water his paintings sparkle and glisten. The very large size posters he painted to advertise and promote ‘The Wapping Group’s’ exhibitions have also become highly collectable. Having resided in London, William Eric Thorp eventually settled in Nottingham, living in a nursing home where he died in 1993.